The nostalgia of a classic chair, which brings memories and awakens memories. FDB is the contemporary version of a classic chair that comes back with Hay design. The relevance of the chosen colors make FDB modern and up-to-date, perfectly fit in any environment of your home. At the dinner table, in a corner near the window, FDB unites Scandinavian minimalism with the practicality of being able to use it every day. 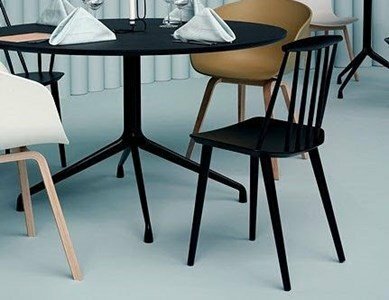 Chair in lacquered solid beech black, or soaped solid beech.